Flame retardant foam leaks and fills Tambour factory in Akko raising fears of people getting trapped, for the third time in as many years. Large fire and rescue forces were called on Monday morning to the Tambour paint factory in Akko after a leak of massive quantities of fire retardant foam. Initially, three people were feared missing in the foam, but they were later located safe and sound. While the foam is not a particularly toxic or dangerous chemical, it poses a threat in that people trapped in the material may easily be suffocated. This is now the third time that the same Tambour factory has been hit by this sort of accident within a three year period, reports Channel 2. Four firefighting crews were dispatched after initial reports of the incident came in. 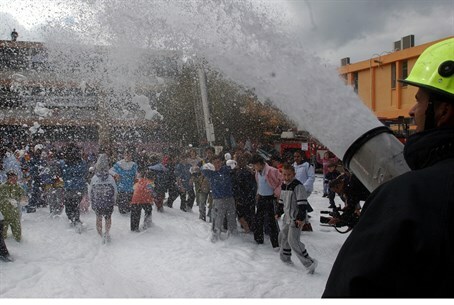 At the factory they found huge amounts of the foam, in some places reaching as high as ten meters (around 33 feet). The foam is part of the firefighting system, and is meant to be automatically deployed in the case of a fire. Firefighter spokesperson Zevulun "Hezi" Levy noted that in 2012 a similar incident occurred at the factory during which six trapped people were located, and another similar incident ended with no one wounded or trapped. While an external company is responsible for the foam system, an investigation to try and discover why the problem keeps reoccurring is anticipated in the near future.